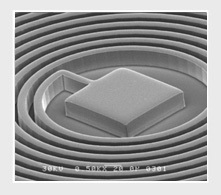 For the past two decades, Futurrex has focused on building robust product categories that encompass every aspect of the broad realm of analog semiconductor manufacturing, predominantly in markets that utilize g, h and i-line exposure wavelengths. Our comprehensive suites of front- and back-end-of-the-line products continue to be core elements in production facilities spanning Asian ODMs to domestic players, where products range from MMICs, power amps and passive components to next-generation RF-transceivers on exotic substrates. We continue to be a complete solutions provider while continuously evolving to produce novel product categories and groundbreaking solutions that cater to rigorous customer demands. Regardless of whether a customer needs an enabling solution that would differentiate performance or if a customer is simply trying to shift cost curves, Futurrex has capabilities and solutions that can meet the most esoteric customer requirement. 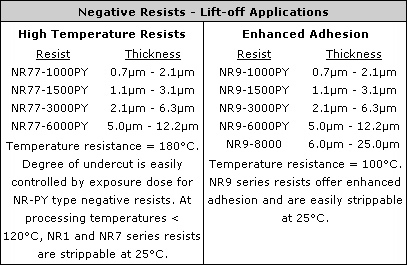 NR9-PY series negative resists for lift-off applications where advanced adhesion, higher throughput or higher temperature processing is required. NR9-P series negative resists for plating and wet etch applications where advanced adhesion is required. NR71-P series negative resists for mask applications in dry etching and for us as a permanent spacer in devices. 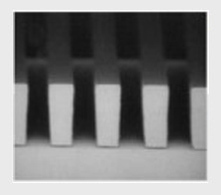 NR21-P series negative resists for extreme thickness applications of greater than 100μm where superb resolution is required. 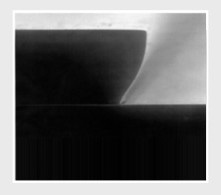 IC1/DC5-series coatings for spin-on dielectric and smoothing applications. Please inquire about how we could provide you with a custom-built solution for any process requirement by filling out a request for information form here.